A packed ringside saw Mr Norman Kyle judge one of the best spring shows in recent years. His champion and reserve came from an excellent, well presented line up from Robert McTurk, Barlaes,Dalry, Castle Douglas. The champion, Barlaes Robina 28th is a Barack Obama of Fingland daughter, this April, 2012 born sold for 2600gns to return purchaser, D Weeks, Twyn ffilkins, Pontillanffraith, Wales. Mr Weeks also paid 2600gns for another of Robert’s 10 heifers, Barlaes Brownie 27th this 21 month old heifer is again a Barack Obama daughter . 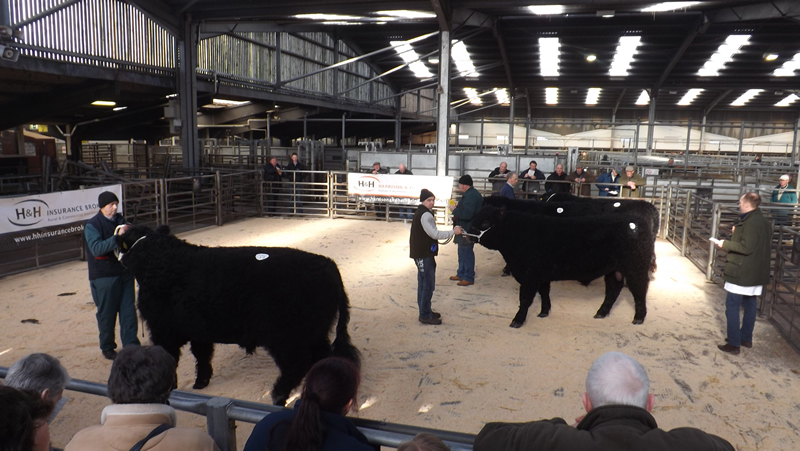 The reserve champion again a Barack Obama daughter, is a month older than her champion stable mate and sold to D & R Cornthwaite, Balgray Hill, Lockerbie for 2300gns. 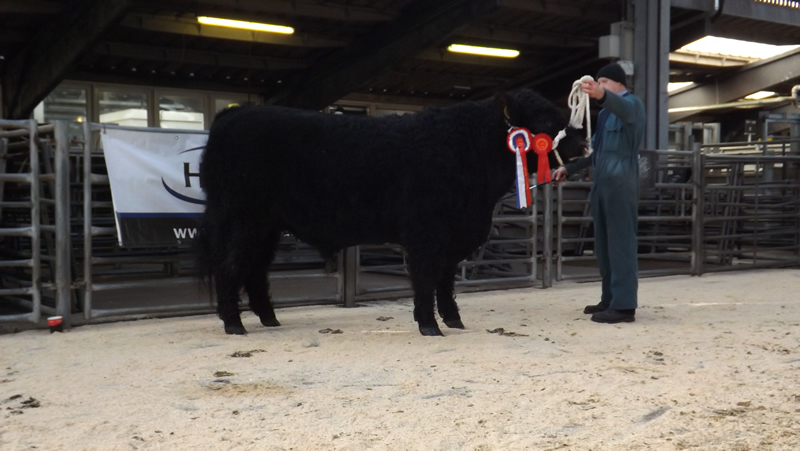 The champion male was Ballavair Black Diamond from Isle of Man based John Teare, this Klondyke Powerplay son sold for 1100gns to Lochenkit Farm Partnership, Bettyknowes, Crocketford, Dumfries. 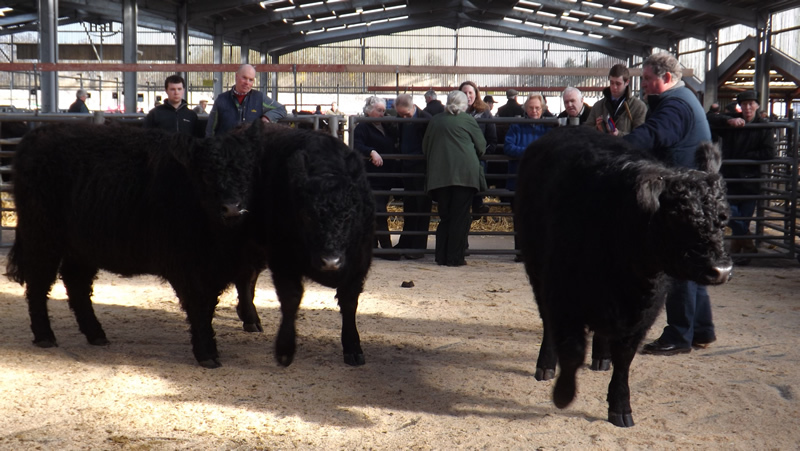 Husband and wife partnership, Gordon and Kathleen Gilligan, High Creoch, Gatehouse of Fleet sold the top price bull Merlin of High Creoch for 1700gns, this 3rd prize bull sold to Mr J Thornton, East Murton Farm, Wingate, County Durham. Mountbenger Fabio from J F Irving & Son, Mount Benger, Selkirk was also sold for 1500gns, this Braveheart of Gall-way son sold to Ardwall Farms, Ardwall House, Gatehouse of Fleet.